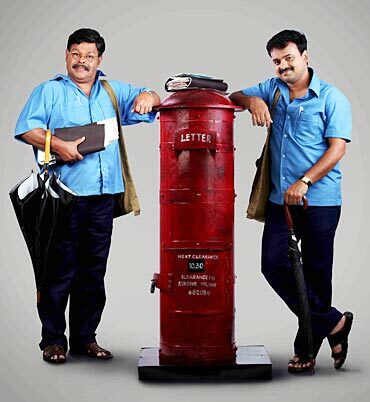 Rediff.com » Movies » Are you ready for this postman? Are you ready for this postman? Tamil actor Sarath Kumar is getting great acceptance in Malayalam after his excellent portrayal of Edachena Kunkan in Pazhassi Raja. He is part of the multi-starrer Christian Brothers and the actor is playing a wild-life photographer in Shaji Azeez's Oridathoru Postman. According to the director, "Oridathoru Postman is mainly about the relationship between a father and son, played by Innocent and Kunchacko Boban. Kalabhavan Mani plays a cop in the film and Meera Nandan is the heroine. Shaji has earlier directed the film Shakespeare MA (Malayalam), with his then partner Shyju. Gangadharan (Innoncent) is a postman in a village and he is not very particular about doing his duties well. He is not too bothered about delivering letters to the addressees on time. He even uses the money orders for some silly things. The villagers are quite enraged by Gangadharan's behavior and it is his son Raghu Nandanan (Kunchacko Boban) who repays all the money that his father owes. Raghu is a smart young lad, who has great hopes about his own life. He coaches students to appear for PSC (Public Service Commission) exams and he himself expects to get some nice government job. To earn more, he does a variety of jobs including real estate, mutual fund sales and so on. But his salary is just about enough to settle the issues created by his father. Raghu helps his father in delivering the letters and one day, he finds that several letters addressed to a person named Yaseen Mubarak (Sarath Kumar) remains undelivered at his place. Now, the search to find the person begins. "Yaseen was a friend of Gangadharan and came to the village as a wild life photographer. He is a socially conscious person who has enlightened the villagers to keep the premises clean from plastic and tobacco," says Sarath Kumar. He is quite excited by the response of the Malayali audiences towards him and plans to do more films, if the offers are attractive. Meera Nandan is a student at the entrance coaching centre, who loves Reghu. Kalabhavan Mani plays a funny police officer who is actually a brilliant investigator. Comedians Suraj Venjarammood, Salim Kumar and Jaffer Idukki will tickle the funny bone. Produced under the banner of Nila Creations, Oridathoru Postman has screenplay and dialogues by K Gireesh Kumar. The story has been written jointly by Shaji Azeez and K Gireesh Kumar. Anand Balakrishnan wields the camera. The music director is Mohan Sithara.